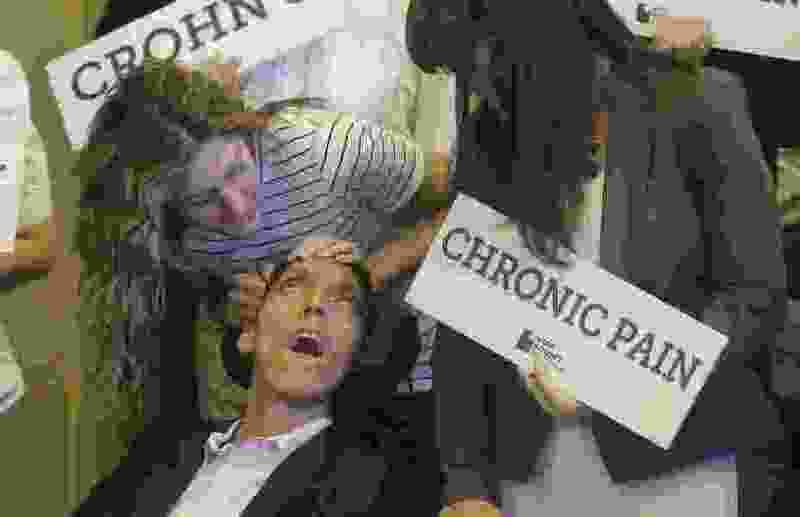 (Rick Bowmer | AP file photo) Desiree Hennessy, left, attends to her adopted son Hestevan, who has cerebral palsy and suffers from chronic nerve pain, seizure disorder during a Utah Patients Coalition news conference at the Utah State Capitol in June in Salt Lake City. Poll numbers show that fully two-thirds of Utah residents favor passage of a ballot initiative, backed by the coalition, to legalize some medical uses of marijuana. Utahns’ support for a proposed 2018 medical marijuana ballot initiative remains strong, a new poll shows, as backers gather about 1,000 petition signatures per day ahead of an April deadline. A full 76 percent of Utah voters either strongly or somewhat support the proposed initiative, according to the poll by The Salt Lake Tribune and the University of Utah’s Hinckley Institute of Politics. Those results are nearly identical to an October survey that tallied 75 percent support, and another in July, which showed backing by 77 percent of state residents. Some 94 percent of Utah Democrats responding to the latest survey supported medical legalization, while 64 percent of Republicans liked the idea — a similar breakdown as three months ago. A majority of voters who identify as “very conservative” or “somewhat conservative” also backed the initiative. The new numbers come as the Utah Patients Coalition, the group backing the proposed ballot measure, nears completion of its statewide signature-gathering efforts to get on the ballot, and as the Utah Legislature convenes with several proposed marijuana bills on its agenda. “People have made their mind up about this issue after years of being presented with the facts,” DJ Schanz, executive director of the group, said of broad support for the initiative in recent polls. “I think people are ready for this,” said Christine Stenquist, president of Together for Responsible Use and Cannabis Education (TRUCE), which is working to educate Utah voters on medical marijuana. Though recent survey numbers have been consistent, support for legalizing some marijuana uses has climbed in Utah since a year ago, when a poll said 54 percent of voters somewhat or strongly backed legalization. The Utah Patients Coalition has roughly 100,000 signatures collected out of the more than 113,000 required to be filed with the state by April 15, Schanz said. He said the group expects to finish the job in about three weeks. The initiative would allow consumption of several types of medical marijuana products for qualifying illnesses, such as Alzheimer’s disease, cancer, multiple sclerosis, post-traumatic stress disorder, chronic pain and autism. Smoking the drug and using it in public would be banned. If organizers succeed, the medical marijuana question would go on the November ballot. And if it passes, the proposed law would cost Utah $1.1 million in startup costs and $400,000 per year for administration after that, according to a state-commissioned analysis. Meanwhile, the 2018 Utah Legislature, which convened Monday, will consider several marijuana-related bills this session. Rep. Brad Daw, R-Orem, is sponsoring a “right to try” bill for terminally ill patients, where they could request a cannabis-based treatment from a physician, and another bill related to growing marijuana for research purposes. Stenquist called the right to try bill a “half measure” when voters are clearly ready for full medical marijuana legalization. “Legislators should probably pay attention to the poll [results],” she said. “We’re in the driver’s seat,” Schanz said. Daw has said he doesn’t support the ballot initiative, because he worries its language is too broad, and it would be a big step toward legalizing full recreational marijuana use in the state. He worries that language in the proposed law might indirectly allow smoking. Stenquist said Daw’s concerns — that the initiative could soon lead to full legalization — is a concern she hears often. But she doesn’t buy it, considering the Legislature is unlikely to ever legalize recreational pot, and it’s hard to imagine a recreational ballot initiative succeeding in the state, considering how hard the push for medical pot has been. Recreational marijuana is “decades away” in Utah, she said. Medical marijuana, however, could be less than a year away, if public support holds. Even Gov. Gary Herbert recently said “it’s gonna happen,” when asked by a middle school student about medical legalization. A Herbert spokesman later clarified the Republican governor was talking generally about medical marijuana, not this specific initiative. But she added that Herbert was aware there was broad support behind the Utah Patients Coalition effort.